When most of us are thinking of building a new Adelaide carport, the elements will be a consideration. You’ll obviously want a roof to keep the rain, hail, frost and sun off your precious assets, and you might even add sides or an end to improve protection further. But in some parts of Adelaide and surrounds there’s another natural occurrence that needs to be considered and that’s fire. In areas like the Adelaide Hills, for example, fire during the hotter months is a constant possibility and that’s why the South Australian Government has requirements for all new outdoor structures built in what are called Bushfire Prone Areas. These requirements are in addition to any local government requirements that you’ll need to comply with. Sounds like a headache? It can be, but don’t let these requirements put you off from building your new Adelaide carport. Mr Carports are not only experts at designing and building the best custom-made carports, our branches are managed by local people who understand the requirements in your area, including Bushfire Prone Areas. They can help you wade through the requirements and ensure approvals are obtained as quickly and painlessly as possible. Materials – the use of brick, metal sheets, steel structural materials and concrete are obvious choice for fire prone areas, but guidelines do not preclude the use of timber. However, if your heart is set on timber you’ll most likely need to choose a timber that is bushfire resistant. The location of your Adelaide carport can also be important in determining the construction requirements. A carport that’s built adjacent to a house may need to meet the same construction requirements as the house, while one built several metres away is likely to have less stringent requirements. 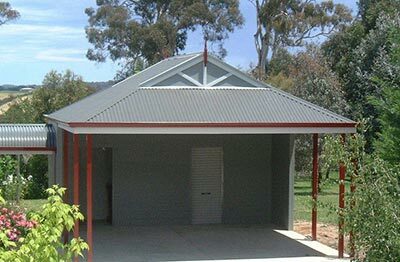 You can look at this South Australian Government website for more information about building in bushfire prone areas or, to save the confusion, simply give Mr Carports a call and we’ll look after everything for you. Phone us on 1800 557 782 or visit the Adelaide carports page on our website for more information about designing and building a carport in the Adelaide area.